Navi may skip ray tracing for the initial release, focusing instead on boost performance for the midrange sector. AMD hasn't released a truly new GPU architecture for its graphics cards since its RX Vega line in 2017, over 18 months ago. Sure, the Radeon VII and RX 590 are new models, but both represent die shrinks and tuning of the existing Vega and Polaris (respectively) architectures. The Polaris architecture dates back to mid-2016, a three-year hiatus for the midrange graphics card market, but there are rumblings coming from the earth suggesting that's about to change. After bringing the Radeon VII to the consumer market in February, I wondered if that might be it for AMD's 7nm GPU aspirations in 2019. 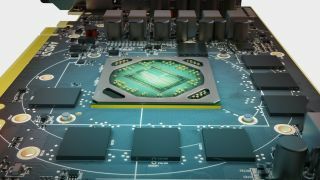 Thankfully, it appears I was overly pessimistic, and there are plenty of indications that AMD will be unveiling both its Ryzen 3000 CPUs and Navi 10 GPUs at Computex in late May/early June. Or at least, the press will be briefed on the new CPUs and GPUs—several other rumors indicate a July 7 retail launch date for Navi. That's 7/7 if you're wondering, a not-so-subtle indication of AMD's use of TSMC's 7nm lithography. I'm not fully sold on the 7/7 launch date, but it's almost certain we'll see new AMD Navi GPUs sometime in the June to August time frame. As to what those GPUs will actually entail, things start to get a lot less clear. It's no secret that AMD GPUs have fallen behind Nvidia offerings, in performance, efficiency, and features. This has been the status quo dating back to at least 2014, when Nvidia's Maxwell architecture doubled down on efficiency, without sacrificing performance. That left the Radeon R9 family to compete primarily on price. Each new family of GPUs largely failed to close the gap, especially when it comes to power efficiency and even die sizes. AMD does compete on price, to varying degrees, but it's time for a new design. We know very little about the actual specs for Navi, other than it will use TSMC's 7nm process technology. Budget and midrange focused Navi 10 models (and Navi 12, according to some rumors) will come first, and they'll forego HBM2, opting for more economical GDDR6 and maybe even GDDR5 memory. A higher performance Navi 20 design is expected to come later—though how much later isn't clear. That could use GDDR6 as well, or it might see a return of HBM2. The move to 7nm allows for a substantially smaller die size, higher clockspeeds, increased core counts, and new features. However, current indications are that AMD won't be adding any specialized hardware cores for ray tracing, at least not with Navi 10. Navi 20 (a variant of which is likely to find its way into the PlayStation 5) will be where AMD adds ray tracing hardware, and it will replace the current Vega and Radeon VII cards, but it likely won't be available until 2020. But for the initial Navi 10 GPUs, AMD will try to increase the performance it offers in the budget and midrange markets. That means more cores, and higher performance per core. Looking at the Vega 64 vs. Radeon VII core size, we can get at least a reasonable estimate of what can be done. Vega 10 (Vega 64) at 14nm is a 486mm^2 die with 12.5 billion transistors, Vega 20 (Radeon VII) at 7nm is a 331mm^2 die with 13.2 billion transistors. That's 32 percent smaller with 6 percent more transistors. With similar scaling, AMD could end up with a 200mm^2 die with 40-48 CUs (2560 to 3072 streaming cores). Toss in higher clockspeeds and lower power consumption, with more memory bandwidth thanks to GDDR6, and the top Navi 10 part could be competitive with RTX 2070. Another option is to just stick with similar core counts but focus on improving efficiency, shrinking the die size, and keeping cost down. GDDR6 can boost memory bandwidth by 75-100 percent compared to GDDR5, so Navi doesn't necessarily need more memory channels. Keep the 36 CU (2304 cores) of Polaris and just clock it higher, while shrinking the die size down to 150-170mm^2, and AMD could end up with a part that matches GTX 1660 Ti performance but costs less to produce. For now, it's not clear which approach AMD will take. I've held off weighing in on the AMD Navi speculation for the past several months, largely because so many of the rumors have been wafer thin. Or if you prefer, many so-called leaks are just pulling numbers out of a hat and making up a "news" story. The model numbers of the Navi GPUs are still unknown as far as I'm concerned—and no, I don't think RX 3000 is likely. It could happen, or we could get the RX 600 series, or RX Navi, or maybe even RX 777—AMD seems to like the number 7, right? But whatever the new cards are called, AMD will stick with the usual approach of offering multiple levels of performance, based on varying GPU designs. The first Navi 10 cards are slated to go after the midrange market, priced around $250. They'll replace the current RX 590/580/470 line, most likely with two models. Whether they're called RX 680/670 or something else isn't really important. Below these will be at least one budget card, but the budget market is tough to get right. Look at the RX 560 vs. RX 570 right now: the RX 560 4GB starts at $100 and the RX 570 4GB starts at $120, but the 570 is nearly twice as fast. The difficulty is that there's a certain minimum amount of stuff that goes into a graphics card—the PCB, GPU, memory, capacitors, video outputs, cooler, etc. It's why most new GPUs start at $100, even if they're relatively slow, and it's also why we don't generally recommend the cheapest GPUs (eg, GT 1030 or RX 550). The $150-$250 range is typically where the best values lie, delivering good performance at a reasonable price. For now, there's very little concrete information on AMD's Navi GPUs. We strongly expect a launch this summer, with an unveiling at Computex. That's the earliest we expect to see the cards go on sale, and as Computex gets closer we'll probably start seeing more actual leaks rather than hypothetical GPUs. Some rumors hint at an RTX 2080 competitor, but Radeon VII already goes after that niche and it's difficult to imagine a replacement this soon, never mind getting one at a price below $300. If Navi does end up competing with the RTX 2080, I expect the price will start closer to $450-$500—but without ray tracing support or Tensor cores. As far as architectural changes, AMD hasn't gone into any detail on whether Navi will continue to use GCN, or if it features more fundamental changes. It will likely build off AMD's prior GPU architectures, perhaps with some improvements to memory compression and other techniques, but we'll have to wait for additional details. And as always, we'll want to run independent benchmarks before providing a final verdict. Check back later, as we'll be updating this article as additional information comes to light.